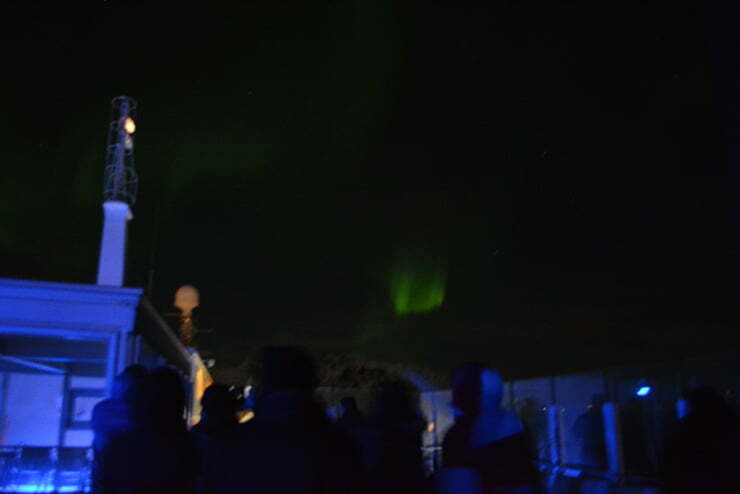 Hurtigruten Diary Day 4: We crossed the Arctic Circle and have enjoyed a day of fantastic winter weather, and our first glimpse of the northern lights. It's been great to hear from people following along with my updates in real-time. I've even had some invites from readers for coffee, and also found out that many of the crew are reading along too. Hello to you! Some people have asked to see more of the ship and especially the food, and I promise you that's coming! But today was full of interesting port stops, so that's where the focus will be. Finally! Since we crossed the Arctic circle a little after 7am, the weather has improved dramatically. The skies are clearer, the waters calmer, and temperatures have plunged. Just how it should be! 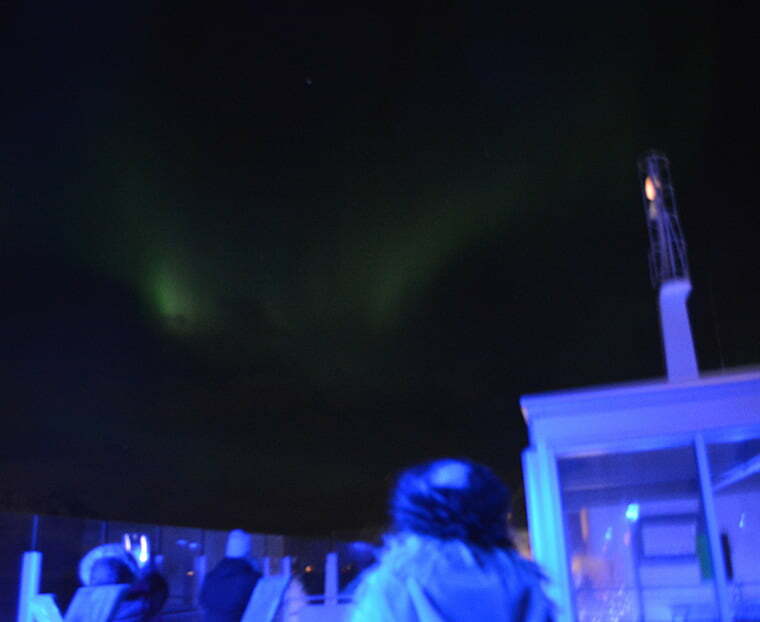 Not only is it more comfortable to get off the ship and explore, it also improves the chances of seeing the northern lights. While I've seen them before, I would love a good display so I get the opportunity to see everyone's reaction! 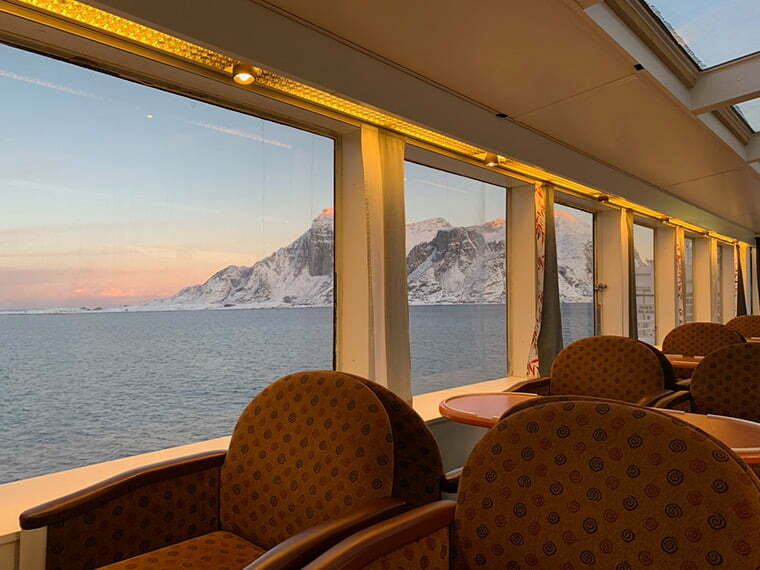 At some of the smaller ports where the landscape is the main attraction, it's easier to stay on the ship and go out on deck for the best views, rather than getting off. That's especially true at places like Ørnes where the ship calls for barely 15 minutes. This morning was chilly but the ‘blue hour' lighting drew several people out to take in the gorgeous scenery. Finally, this is Norway! The improved weather also makes a seat in the panorama lounge a more pleasurable experience. Despite the appearance in the picture below, it was the fullest I've seen it on the voyage so far as we made our way from Ørnes to Bodø. 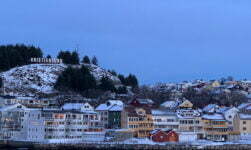 Bodø is growing on me! Despite the best efforts of the local who was showing me around, I remember my feeling the first time I visited that this was an ordinary city that happened to be surrounded by beauty. This is the third time I've visited Bodø now and I'm starting to like the place. There's more street art, and more interesting bars, restaurants and shops, and there always seems to be something going on at the new library / cultural centre overlooking the marina. 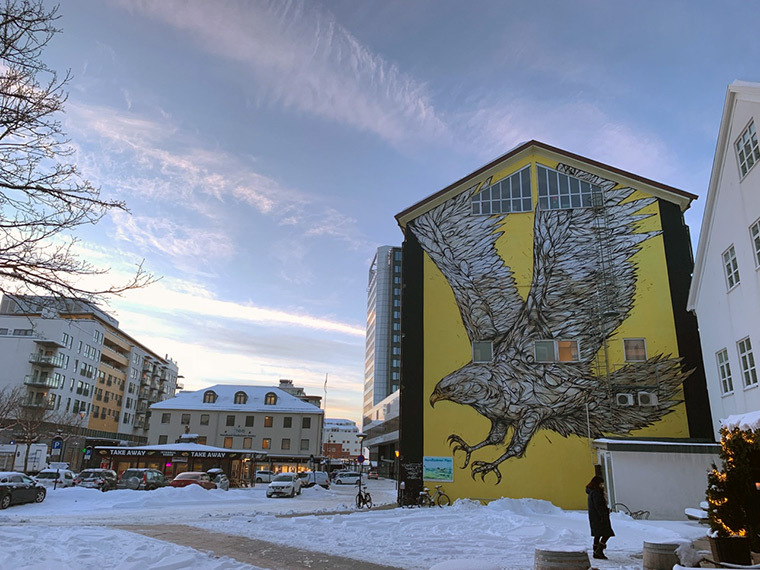 Bodø has been shortlisted to become one of the European Capitals of Culture in 2024. As such, there's a lot of investment in the city right now and a lot of interesting projects underway or in the planning stage. 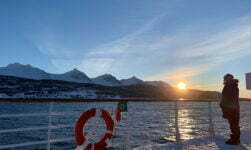 As we were leaving Bodø I made my way up to the outdoor deck to watch and film the departure. 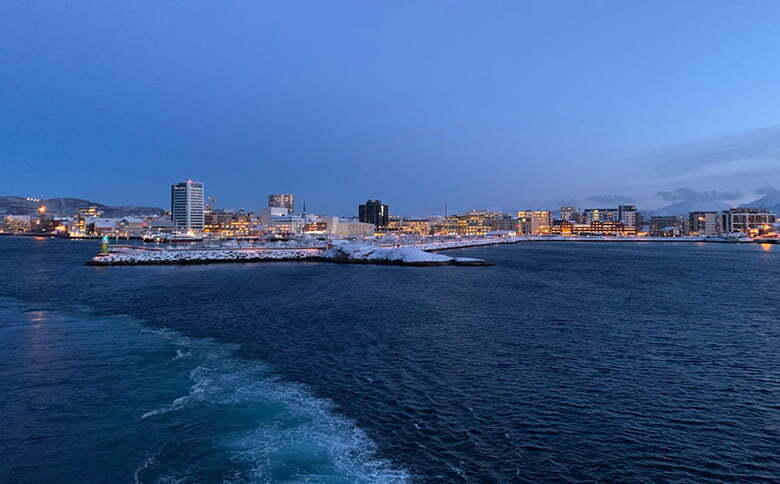 Bodø is an interesting place to leave by ship because of its geography. The vessel passes the city centre before making a sharp almost 180-degree turn around the Nyholmen peninsular to head out to sea. As we sailed away, I couldn't shake the feeling that I'll be back sooner rather than later. After the four-hour crossing we reached the Lofoten islands. 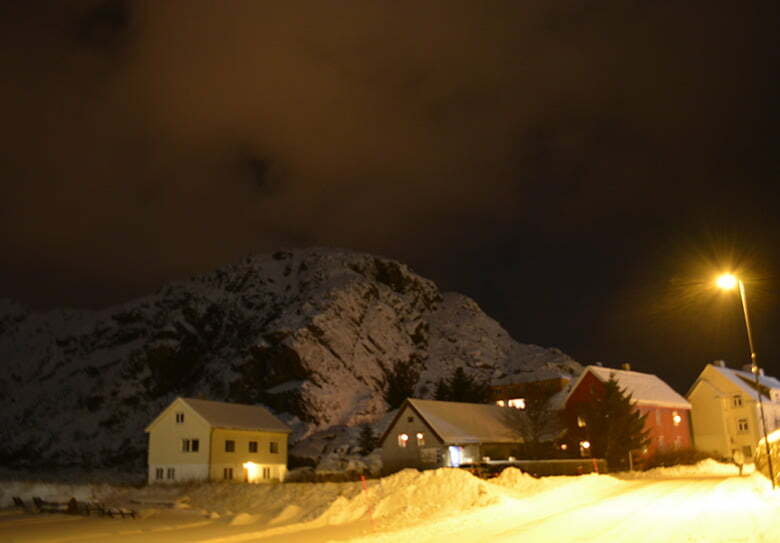 Visiting Lofoten at this time of year is somewhat of a double-edged sword. You can't see much general scenery because of the darkness, but what you can see when you get close enough is even more spectacular than usual. Firstly, we made a quick half-hour stop in Stamsund, which was just enough time for me to hop off the boat for a wander around and some quick photos. During the short trip from Stamsund to Svolvær, I managed to speak to the stores manager of the MS Vesterålen. He is responsible for ordering everything that the hotel aspect of the ship needs – from food to toilet paper! Yes, he's the man responsible for keeping the fridges stocked with beer, so the first thing I did was shake his hand. The hardest part of his job is dealing with variation, for example when port calls are cancelled. If he orders salmon for 200 people but weather issues mean the ship must sail on to the next port, he has a lot of coordination to do, very quickly. It was another eye-opening chat about the operations of this world-famous line, and just how much work it takes behind the scenes to keep things running smoothly. We also chatted about what it's like to essentially live on a ship with your workmates for three weeks at a time. 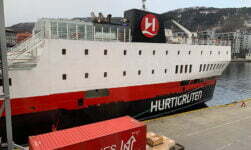 I can't remember if I wrote previously but most Hurtigruten staff work 22 days on, 22 days off. That's two full coastal voyages one after another. Somewhat surprisingly, he really likes living aboard, and considers his colleagues a second family. This is especially important at Christmas time, when it could be easy to get homesick. I've come to discover it takes a specific kind of personality to succeed as a Hurtigruten employee. 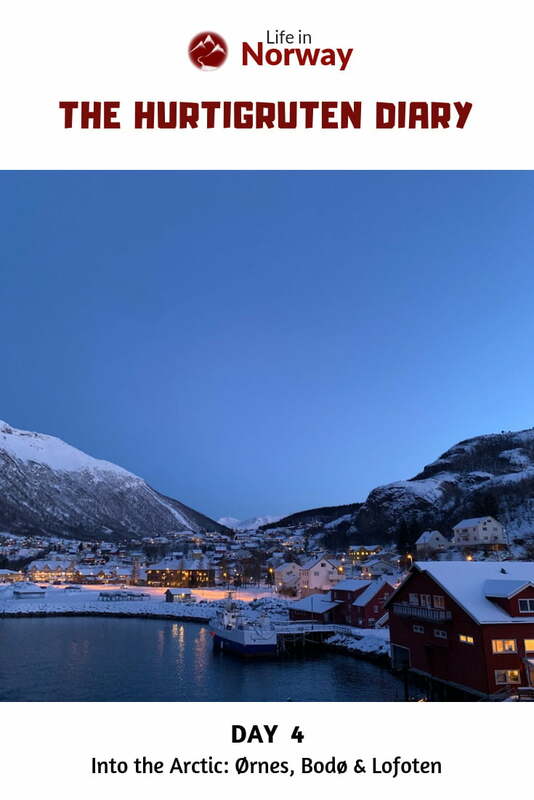 No sooner had I finished chatting, it was time to hop off the boat again as we reached Svolvær, the biggest town in Lofoten and one of my favourite places in Norway. 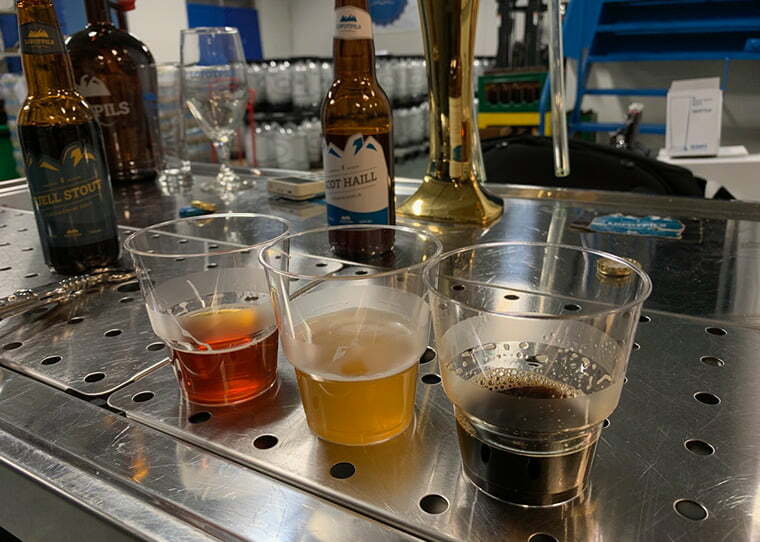 I spent 55 minutes of the one hour call on the Lofotpils brewery tour. Thankfully it was just a one-minute walk from the ship! I'm going to write more about Lofotpils in a separate article because I learned a lot and want to share plenty of photos, so watch out for that! 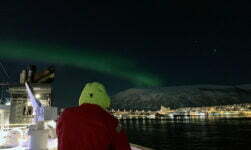 Shortly after leaving Svolvær I was chatting with the tour manager as he received a note from the bridge that there was northern lights activity. I joined him in running up the stairs to take a look and although there was some, it was very faint. I wondered if he would “make the call”, aka announce it to the ship, and he did almost without hesitation. This surprised me a little as the lights were so faint, but within 30 seconds of his announcement the intensity of green ratcheted up just in time for the first batch of keen aurora hunters to make it out on deck. Some people were of course disappointed that there wasn't a full-on dazzling display of vivid colour, and went back inside. But those who stuck it out in the cold were rewarded as the colour of the lights turned on and off from clear/milky white to green like a switch for the next hour or so. Blink and you would miss it, but there were moments of intense colour and movement. We're hoping this bodes well for the next couple of nights. The display coincided with the planned visit to the Trollfjord. Perfect timing! 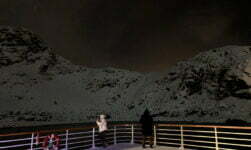 The Trollfjord is famed for its incredibly narrow entrance but at this time of the year, it's too dangerous for the Hurtigruten ships to enter the fjord in the darkness. But just getting a glimpse of the narrow entrance with the spotlights of the ship was enough for me. Once again it was disappointing not to be able see more, but seeing everything by moonlight – which is just enough light to reflect off the snow for us to be able to see the scenery – is quite a special experience. As we approached the fjord the head chef served freshly-made fishcakes and drinks in a souvenir Trollfjord mug. I'm not normally a fan of fishcakes but I gobbled mine up – most likely because it was something hot on a very chilly evening! Enjoying reliving the journey with you, David. We did just the northbound in June 2017. I look forward to your daily updates – I’ve been back from Norway for a fortnight now and your blog is the highlight of my day!! I’m back in 5 weeks time but to Myrkdalen. 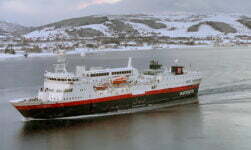 I’ve been onboard one of the ships in Tromso a few years ago – but only for about 45 mins to have a nose! I didn’t know whether I could do a sea journey in case I got bored, but you’ve inspired me that as there are frequent stops I could perhaps do it after all. I’d be able to tick off many of the places I’d love to visit in my favourite country – particularly the Lofiten Islands. Look forward to tomorrow’s instalment. Enjoying reading about your adventures . Sorry you missed the experience of sailing up Trollfjord and turning round to sail back down , an amazing fjord . I have seen more of Norway than most Norwegians . 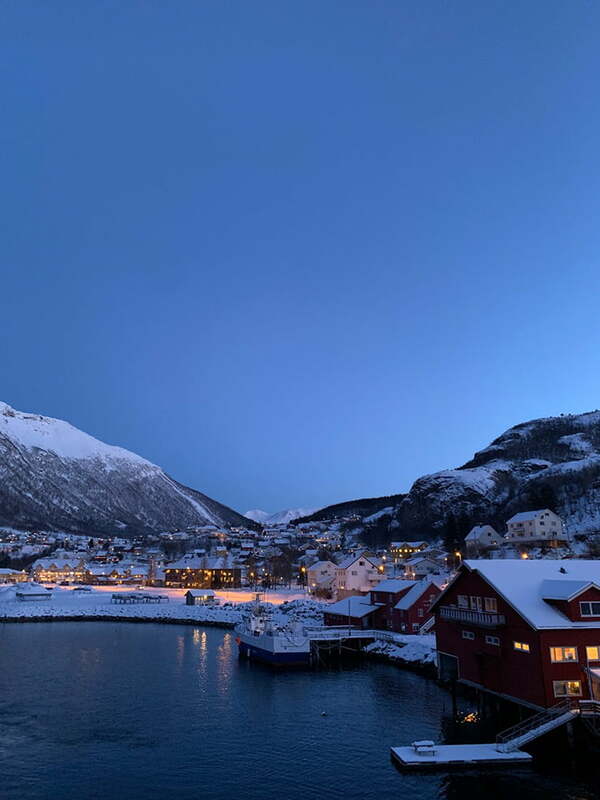 Opps , well I was born near Tromso . Enjoying your trip David. We have family who have just moved out to Bodo and we are visiting in a couple of weeks. its great to share the journey. Loving your diary as I am doing this trip in 3 weeks onboard Nordyls !!! !